This map shows the Capital Beltway (I-495), a 64-mile highway that surrounds Washington, DC and travels through the Maryland and Virginia suburbs. The Capital Beltway passes through Prince George's County and Montgomery County in Maryland, and Fairfax County and the City of Alexandria in Virginia. For more information including driving tips, see Interstate 495 - Driving on the Capital Beltway. Following is a guide to the exits on the Capital Beltway. The highway is a loop around Washington DC and is one of the busiest in the nation. As traffic can be very unpredictable, it is a good idea to get to know alternate routes to get around the region. For specific directions, use a GPS or consult a more detailed map before you begin your trip. Major roads in the Washington DC area include I-495, the George Washington Memorial Parkway, the Baltimore- Washington Parkway (I-295), I-95, I-395, US-50, I-66, I-270, the Dulles Toll Road, I-370, MD-200, and I-70. 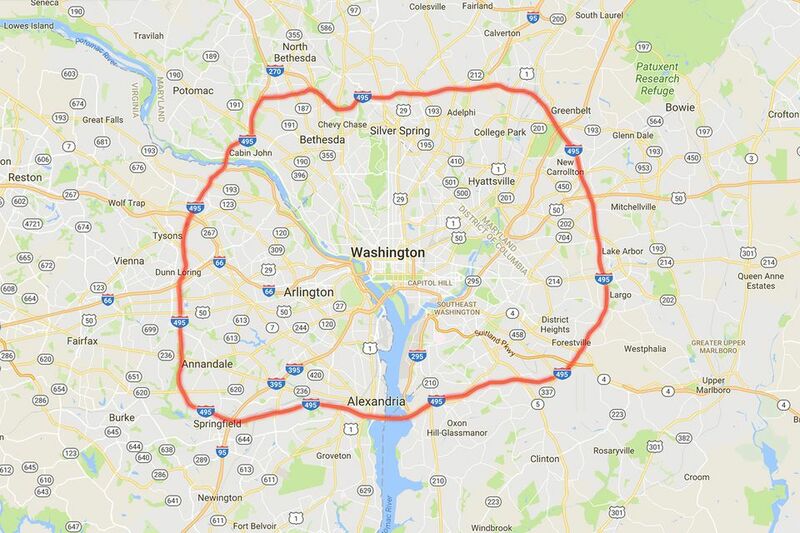 To learn more about these roads and driving in the area, see an Overview of Roads and Highways in the Washington DC Area. Looking for more Washington, DC information? Start with the Washington, DC Home Page, where you'll find current features and an in-depth guide to everything you want to know about the DC/Capital region.